It’s mud season, that distinctly brown stretch between the whites of winter and the lush greens of later spring. True mud season happens in regions cold enough to experience deeply frozen ground during winter (New England and northward). As the snow melts, the ground, still mostly frozen, is unable to absorb the influx of water all at once, making for a distinctly soggy substrate. This presents a special opportunity for the ecosystem because most plants are still dormant at this point. The water can therefore sink past their sluggish root systems and replenish the groundwater. This mucky process sets up a bountiful growing season, restoring the years’ supply of freshwater for streams, lakes, drinking, and irrigation. I also think of mud season as a frame of mind during that awkward time when you’re ready to be outside again, but nature is still too sticky and cold to feel totally inviting. In the city, the abundance of nonpermeable surfaces also contributes to mud puddles and more muck. Even if you don’t have a backyard or garden of your own, your children can still get good and muddy. At Brooklyn Botanic Garden, the soil laboratory in the Discovery Garden is stocked with soil, kneeling pads, sifters, and trowels. You can also scout out a patch of dirt at your local park. Be sure to steer very clear of dog waste, and avoid digging up grass or digging in an area that would damage tree or shrub roots. Try to ask a staff person to suggest a spot. 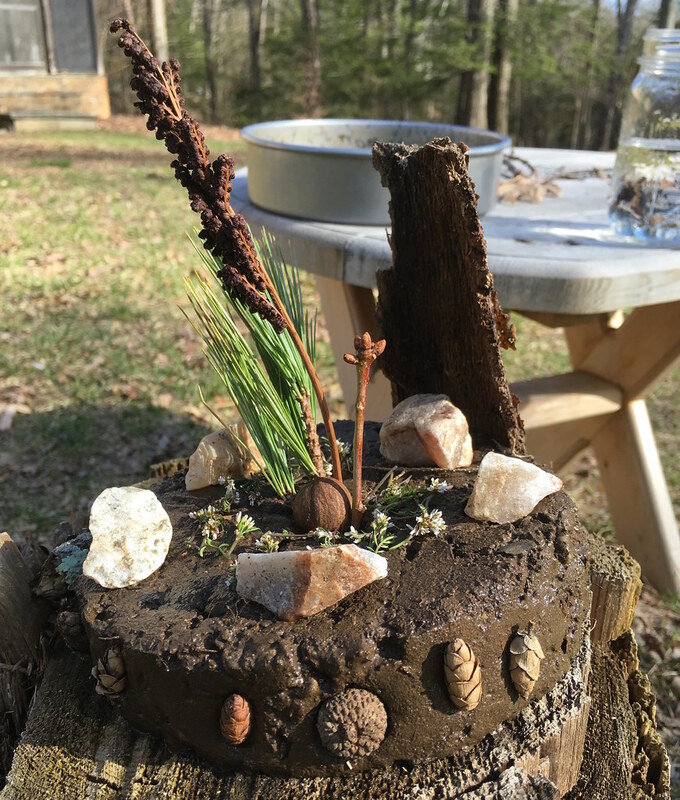 For a well-prepared backyard or park mud pie, bring a small bucket or container for mixing, a trowel, and an assortment of Tupperware, foil cake pans, or sand-castle molds. During early spring, the water fountains may still be turned off in public gardens and parks, so bring a water bottle or two, or a pitcher to fill up in a nearby bathroom. Hand wipes, a change of clothes, and a sense of adventure come in handy. 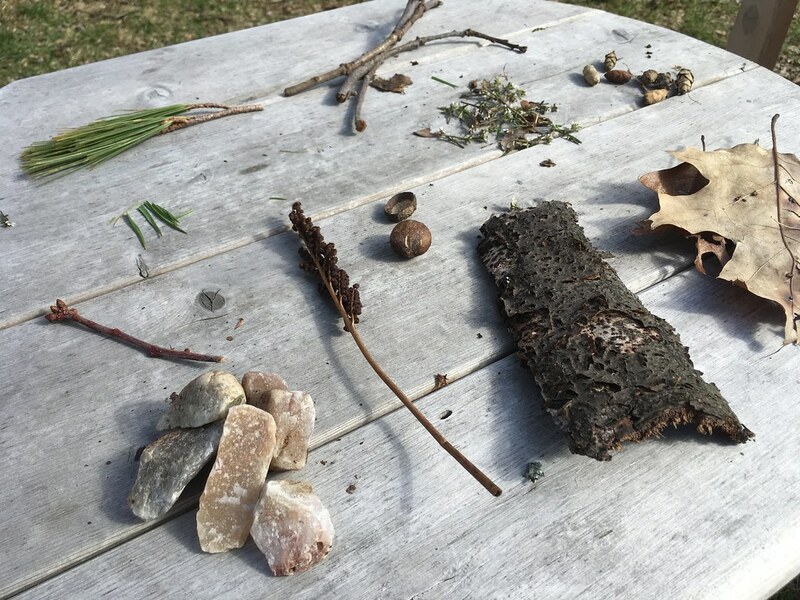 Start by collecting pebbles, leaves, twigs, acorns, cones, and bark for decoration. If you are permitted to pick them, blades of grass or flower petals can add color and style to your pie. Dig up a small quantity of soil and dump it into your bucket. Slowly add water, mixing it after each addition, until you have a consistency that is workable and sticks together (think sticky chocolate frosting) but isn’t watery (avoid pea soup). 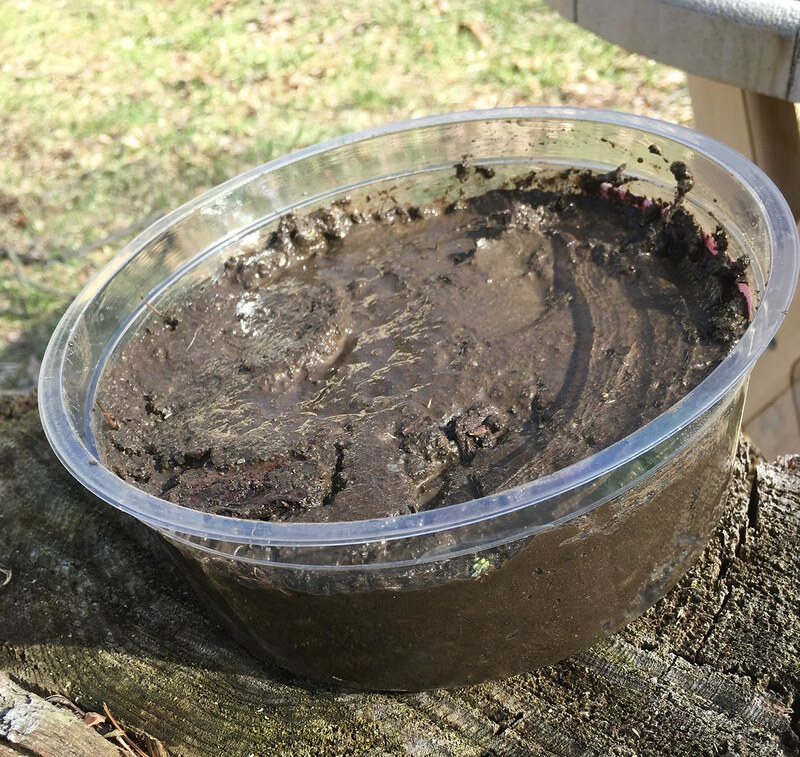 Transfer the mud to your pie dish of choice. Smooth it, wiggle it, and tap it to make it flat. Then, carefully flip it onto the ground. Decorate the top and sides of your pie artfully with your found materials. Slice with a stick, and serve—or leave out for the fairies! For indoor mud, purchase a small bag of potting soil—most commercial brands are sterile, so you don’t have to worry about introducing critters to your home. Cover your workspace with a tarp or a plastic tablecloth and a layer of newspapers. 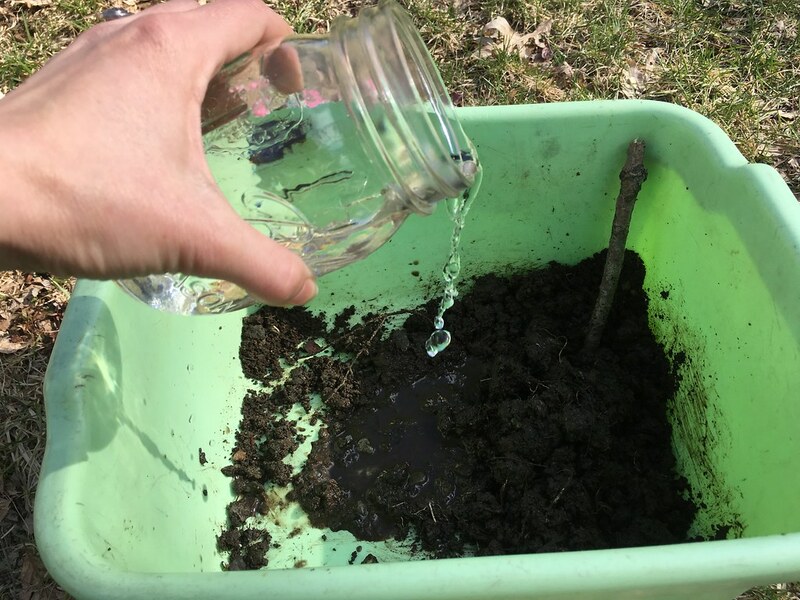 When you’re done, you can keep your soil and accouterments in a storage bin to use again, dry the soil on a tray in the sun to use for indoor plants, or donate it to your street tree bed. 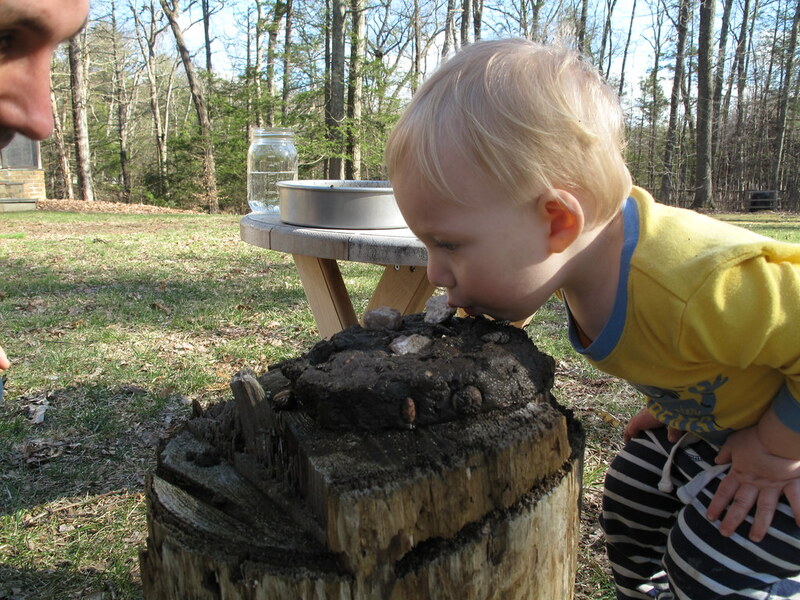 Research suggests that eating the occasional bit of dirt actually builds children’s immune systems. Just smelling the naturally occurring bacteria in fresh soil reportedly triggers the release of serotonin in our brains, making us happier! Time spent playing in nature has been proven to do wonders for kids, from reducing stress to increasing focus, creativity, and attention span. 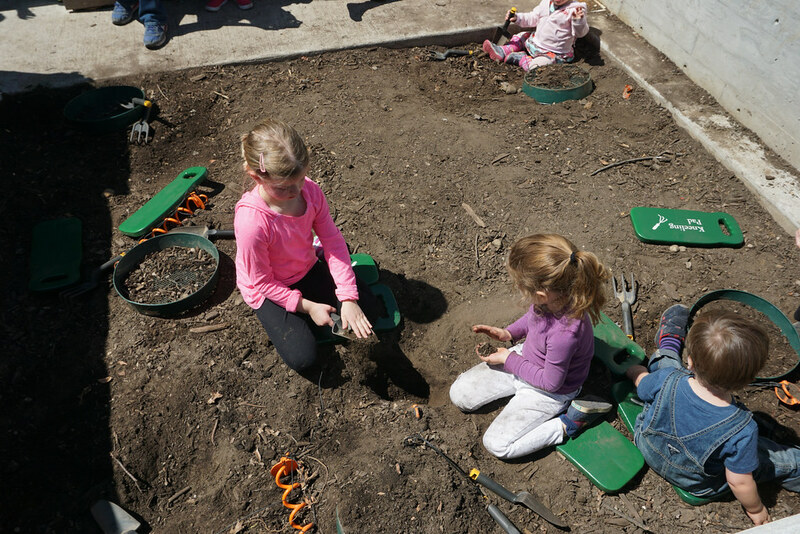 The Discovery Garden has a dig zone where kids can indulge. Photo by Lee Patrick.